The Angel’s Share (La Part des Anges) is what that 2% of liquid that evaporates in the production of whiskey is called. 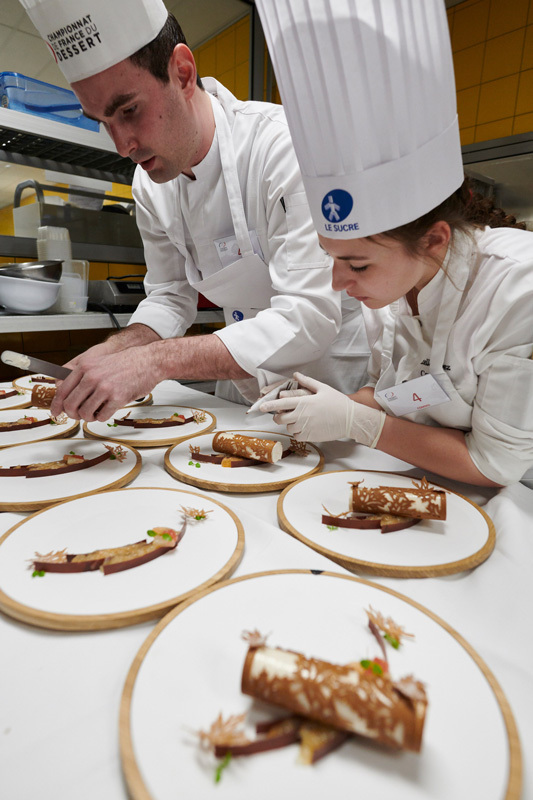 And that is the name of one of the desserts that led Yoann Normand (restaurant Les Crayères in Reims) to win the latest edition of the Championnat de France du Dessert in the professional category. 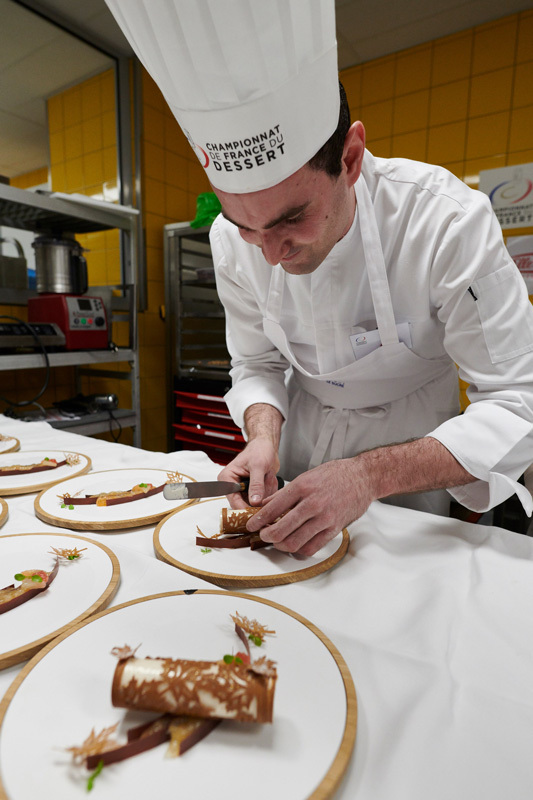 Normand had won the regional semifinal held in Reims with this dish, which revolves around uncontrollable and ephemeral evaporation. 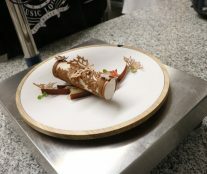 After making some adjustments from the recommendations of the jury of the semifinal, he managed to win in the final with this detailed work in the presentation and exceptional in the tasting. His assistant, Estelle López, was also recognized at the event as best assistant. In The Angel’s Share, Normand wanted to reflect his story and a part of himself, his journeys, and his encounters. 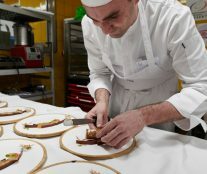 A creation full of details in which nothing is randomly placed, as he himself explains: “The chestnut is light, it brings a note of undergrowth and gluttony (gourmandise). The pink, white, and ruby ​​grapefruits give freshness and a touch of acidity discovered during a time spent in Corsica. Knob Creek Smoked Maple Whiskey, a souvenir of one of my trips in America, lightly perfumes the dessert. The particularity of this whiskey is that it ages in maple syrup oak barrels, represented with engravings on the plate. The tube, which represents the same barrel of oak perforated with leaves that allows this evaporation, is placed on chocolate shapes reminiscent of the curves of the barrel”. Whip the cream at low speed. Mix the chestnut paste and chestnut cream, add knob creek smoked maple whiskey, and finish with a small part of the cream. Finish with the rest of the whipped cream. Reserve in the fridge. Peel the grapefruit. Take 250 g of segments and juice of each fruit. Heat the fruit and citric acid. Subsequently, add the pectin with the premixed sugar. Cook until it is consistent and reserve. Peel and cut the grapefruits and arrange them in jars. Boil the grapefruit puree, maple syrup, and pour over the grapefruit and Timut pepper. Reserve in the fridge. Squeeze the grapefruit to obtain 250 g of juice per variety. Heat the juice and sugar, add stabilizers, and bring to a boil. Add the gin and lemon juice. Arrange in an ice cream maker. Reserve in the freezer. 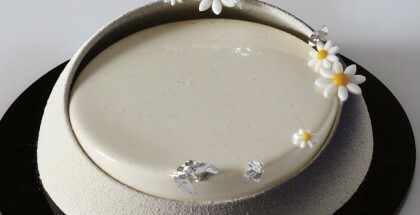 Mix the chestnut paste and chestnut cream with Pacojet. Extend over the molds and silicone strips. Dry in the dehydrator. Cut and unmold. Bake at 170 ° C for 5 to 7 minutes. Mold and roll in a tube. Reserve in an airtight container. Cook the glucose and the fondant at 150 ° C. Cool, mix, add pepper and bake. Roll with the help of a tube and insert into the chestnut tubes. Reserve in airtight container. Blanch eggs with maple syrup and chestnut cream. Add the flour and the baking powder. Add the marron glacés cut into cubes. Bake at 170 ° C for 5-7 minutes. Saturate with the help of the marinated grapefruit. Temper the chocolate, spread between two guitar sheets, cut, shape and set aside. 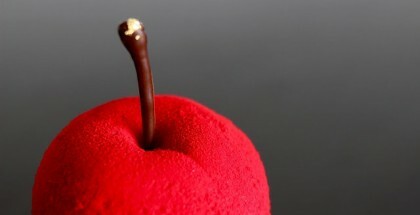 Place the chocolate decorations on the plate and stick them with the help of a cartridge. Put the jam and the grapefruit segments between the decorations. Lightly spinkle the chestnut tube. Fill with the marron chantilly, the grapefruit sorbet, the madeleine, and the jam. 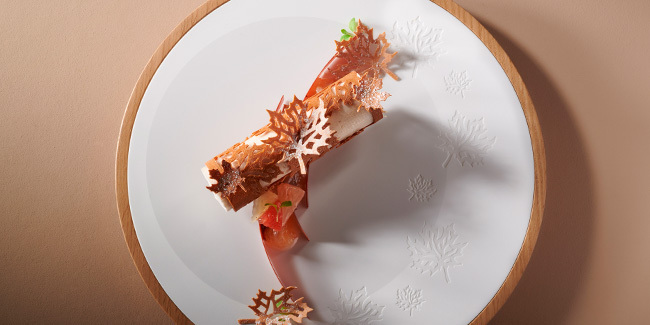 Close with the help of the marron chantilly. Smooth with the spatula. Place on top of the decoration. Sprinkle the maple leaves, and arrange them with the help of the cartridge. 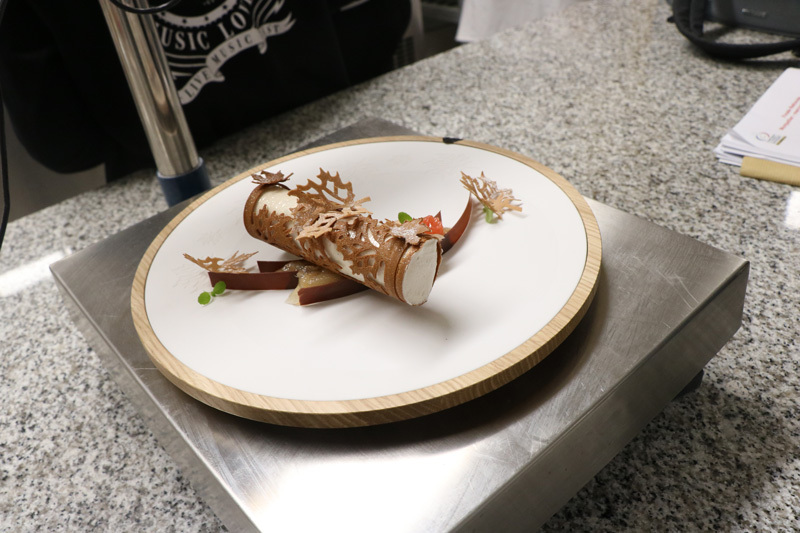 Add the segments and place the herbs maintaining the sensation of movement of the chocolate.